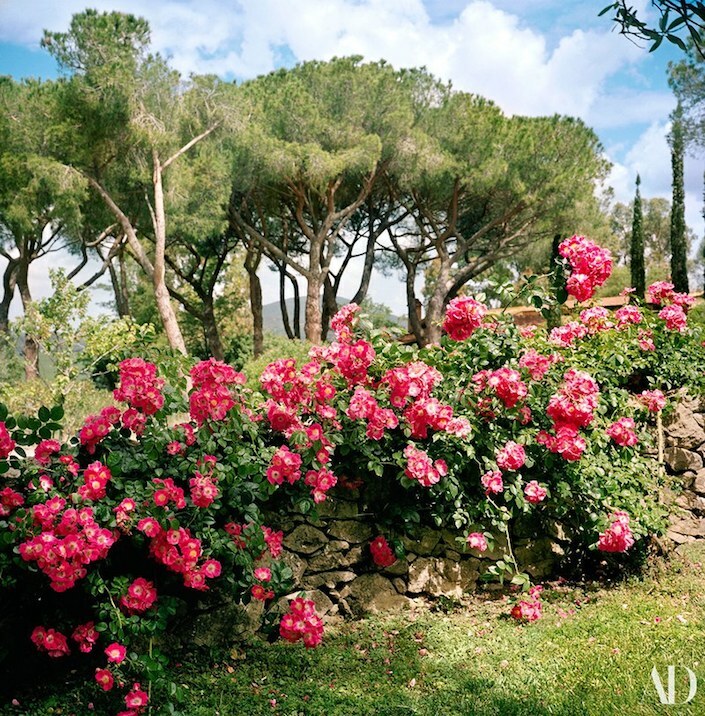 Having spent her very early years traveling around Africa with her mother and then in a Mongiardino decorated Milanese home, Jacaranda’s style at the house is a worldly bohemian mix. And thanks to help from Roman decorator Tommaso Ziffer, it is updated with charm and without pretension. 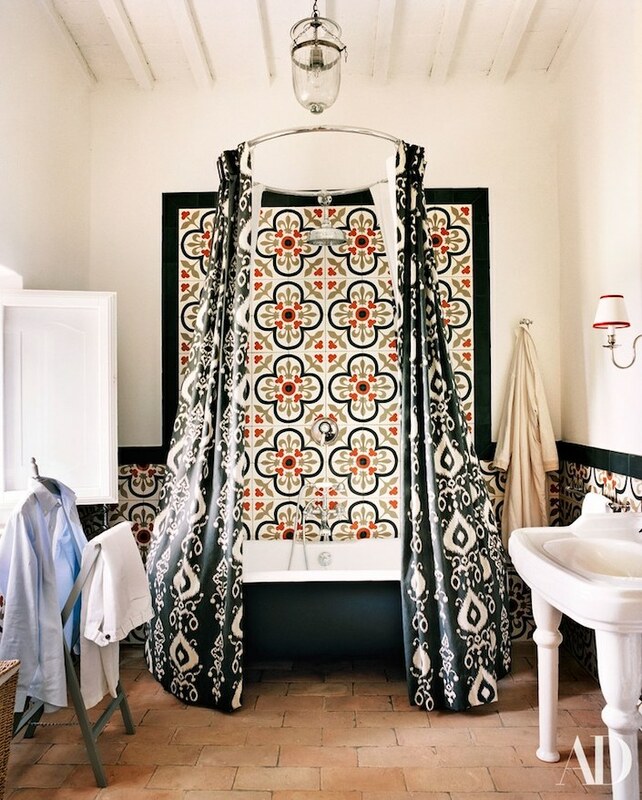 Above, in a salon, a Neapolitan tile floor seems perfectly at home with the graphic punch of a Manuel Canovas velvet, Moroccan lantern and floral slipcovered sofa. 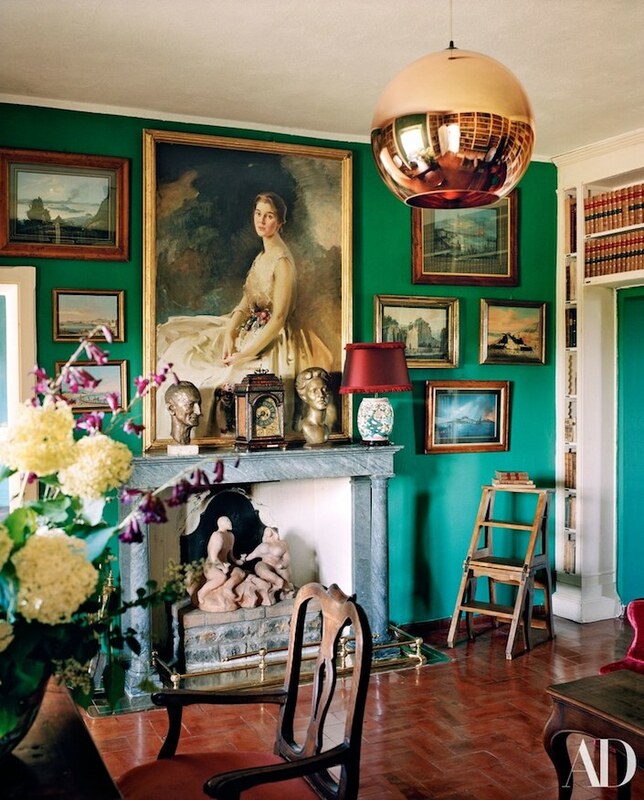 A photo of Jacaranda’s grandmother, American Margaret Clarke (mother to her aunt Marella Agnelli) hangs over the fireplace in the library, where a Tom Dixon light adds a modern flash. 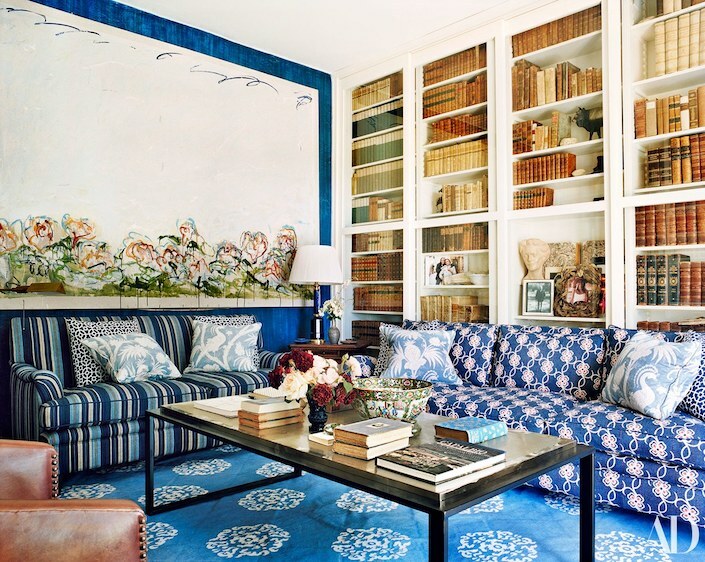 The blue and white living room offers a nod to the coastal location with a panoply of prints, a Madeline Weinrib rug and art by Mario Schifano. 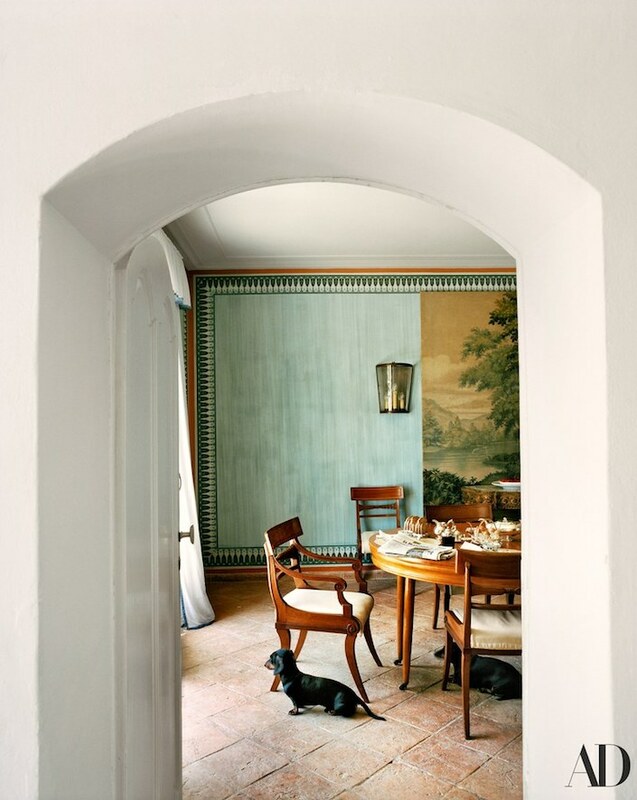 The dining room cleverly uses a Madeleine Castaing border to frame the wall, enhanced with its ethereal painterly finish, while a bathroom harkens back to Moroccan themes with bold cement tiles. But the biggest changes on the property took place in the garden, which was opened up to enhance the views to the sea and redesigned with Stuart Barfoot. This entry posted in interior design. 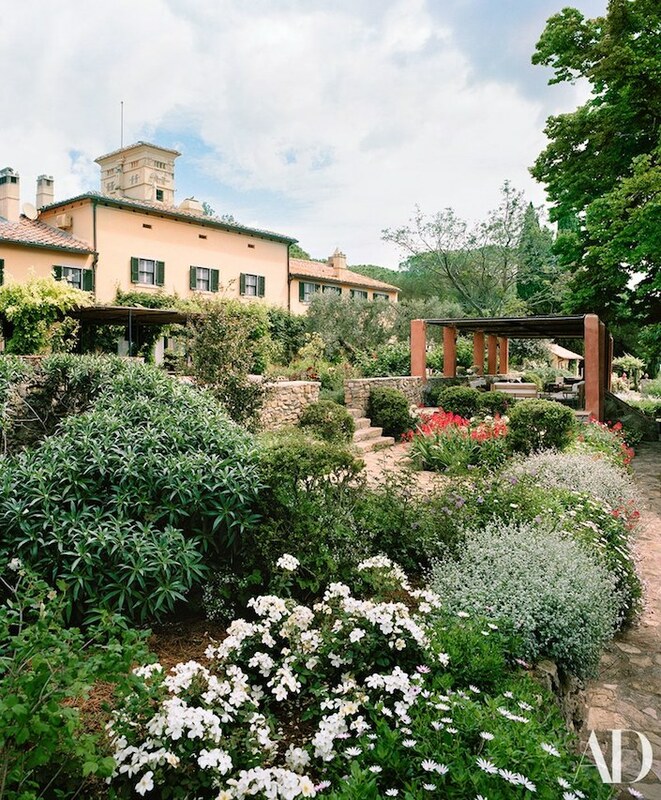 Entry Tags: Architectural Digest, interior design, Italy, Tuscany Bookmark the permalink. I do love it, very warm and inviting!! !